This still from a video by Tom Hands of the University of Leicester offers a glimpse into the speed of planets if every alien solar system known to date. A new video gives viewers a crash course in exoplanet science, comparing the speed of alien planets around other stars and the huge diversity of distant solar systems in just over a minute. The 61-second video tour of alien planets — created by Ph.D. student Tom Hands of the University of Leicester in England — provides a flyby tour of all known planetary systems beyond Earth's sun known to orbit a single star. "I find it fascinating just how much these exoplanetary systems differ from our own system in scale," he added. "I hope people will gain an understanding of the vast differences between systems from the video." 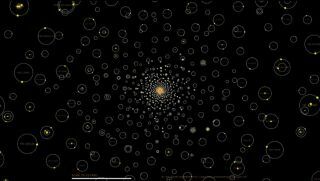 Hands produced the video using data collected in the Open Exoplanet Catalogue, which lists 1,776 confirmed exoplanets in 1,082 alien solar systems as of Tuesday (May 6). Astronomers discovered the first exoplanet in 1992 and first spotted one orbiting a sunlike star in 1995. The pace of discovery has ramped up considerably in the last five years or so, thanks, in large part, to NASA's Kepler space telescope, which launched in March 2009. Kepler's original planet-hunting mission came to an end in May 2013, when the second of the spacecraft's four orientation-maintaining reaction wheels failed, robbing Kepler of its precise pointing ability. But team members have proposed a new mission for Kepler called K2, which would allow the telescope to keep hunting for alien planets, albeit in a more limited fashion, and to observe a number of other cosmic objects. While the new video provides a good introduction to the variety of known extrasolar systems, it does not depict any worlds that orbit two stars. Kepler was the first instrument to find such "Tatooine" planets, which have two suns in their skies like Luke Skywalker's home planet in the "Star Wars" films.